The twin epidemics of obesity and its cousin, diabetes, have been the target of numerous studies at Harvard and its affiliated hospitals and institutions. Among seminal findings was the first study to document the extraordinarily tight connection between the two diseases. Research done by Harvard School of Public Health Professor Walter Willett and his colleagues showed that being even slightly overweight increased diabetes risk five times, and being seriously obese increased it 60 times. When it comes to the nation’s growing obesity and diabetes epidemics, the more we know, the more the evidence points to one conclusion: We’ve been set up. Important findings about humanity’s past, about how we live and eat today, and even about how we typically treat type 2 diabetes — with medications that themselves induce weight gain — are providing clues that explain how the past two decades could see an explosion in overweight and obese Americans and skyrocketing cases of type 2 diabetes, which is usually closely tied to the problem. Harvard’s extensive research on the subject weaves a story of ancient humans who were both extraordinarily active and able to easily gain weight in times of plenty. It illuminates how a modern diet rich in refined carbohydrates and heavy in red meat has preyed on Paleolithic instincts, creating an obese nation, a health crisis, and what one researcher describes as a hard-to-escape cycle of weight gain, insulin resistance, and weight-retaining diabetic medication, leading to more pounds. “It’s not just a trap, it’s a trap and a downward spiral,” said Assistant Professor of Medicine Osama Hamdy, a physician at Harvard-affiliated Joslin Diabetes Center and director of a groundbreaking weight loss program being replicated at Joslin affiliates around the world. Hamdy and hundreds of other Harvard investigators in recent decades have produced a dizzying array of findings on obesity and diabetes. Even a casual look at the years of research on the subject shows a slew of results on how lifestyle affects weight and how weight affects health. It shows new genes discovered, laser surgery to save diabetics’ eyesight, new diabetes drug candidates, and advances in using stem cells to replace the insulin-producing beta cells that diabetes destroys. Findings also illuminate humanity’s active, running past, to help us understand the problem’s roots. Among seminal findings was the first study to document the extraordinarily tight connection between the two diseases. The work, by Walter Willett, the Harvard School of Public Health’s (HSPH) Stare Professor of Epidemiology and Nutrition, and by his colleagues showed that being even slightly overweight increased diabetes risk five times, and being seriously obese increased it 60 times. The study’s authors had to push just to get the results in print. They believe it now. Studies have shown that becoming overweight is a major risk factor in developing type 2 diabetes. Today, roughly 30 percent of overweight people have the disease, and 85 percent of diabetics are overweight. Figures from the U.S. Centers for Disease Control and Prevention reveal that we live in a nation where skinny and normal-weight people are actually in the minority. A third of us are overweight, and another third are so overweight we’re obese. Government figures show obesity rates rising steadily from roughly 13 percent in the 1960s to 34 percent in 2007-2008, with numbers flattening out in recent years. Diabetes cases have risen along with obesity, with prevalence doubling in the past 20 years. 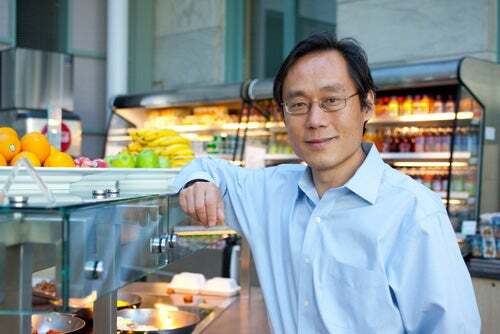 Today, 11 percent of adults over age 20 are diabetic, and HSPH Professor of Nutrition and Epidemiology Frank Hu said he expects the numbers to keep rising. “We haven’t seen any sign of the epidemic slowing,” Hu said. Not all diabetes cases are linked to weight. Genetics also comes into play. People with diabetic family members are at higher risk. For them, even five or six extra pounds can start a dangerous cycle leading to the disease, Hamdy said. Unlike in type 1 diabetes, where the body directly attacks insulin-producing cells, in type 2 the body’s tissues gradually become less sensitive to insulin. This causes beta cells to work harder and eventually break down. Though not everyone with type 2 diabetes is overweight, it is type 2 — which accounts for roughly 90 percent of all diabetes cases — that has been linked to weight gain. Both forms of the disease disrupt insulin flow. Cells have trouble getting the energy they need to function properly. Meanwhile, blood sugar rises. In untreated diabetes, high blood sugar can cause comas and death. Even when the disease is treated, poor sugar control can damage organs, causing complications. Less severe cases can be treated with medication, diet, and exercise, while more severe cases require insulin injections. Diabetes is the nation’s seventh-leading cause of death and a prime cause of kidney failure, blindness, nontraumatic limb amputations, heart disease, and stroke. The government estimates that 26 million Americans had diabetes in 2010, costing $174 billion for direct and indirect costs. There were 1.9 million new adult cases diagnosed in 2010. Harvard faculty members’ work has shed light on why people are so vulnerable to society’s modern temptations by looking at them in ancient times. Daniel Lieberman, chair of Harvard’s Human Evolutionary Biology Department, studies our hunting and gathering ancestors, and says that the ability to pack on the pounds when there’s a food surplus is a critical part of being human. Humans are born fat compared with other animals — 15 percent body fat compared with a chimp’s 4 or 5 percent. Part of the reason body fat is so necessary, Lieberman said, is that our big brains use a lot of energy, 20 percent of our metabolism even when we’re sleeping. In addition, human babies’ extended helplessness made having a few extra pounds an advantage come lean times. Our bodies, adapted to gain weight even on the lean diets of yesteryear, simply balloon amid today’s plentiful, refined foods. Our ancient ancestors’ diet was heavy on tubers, fruits, and vegetables, and lean meat from game animals. In fact, Lieberman said, if you look at what our ancient ancestors likely ate, you’d wind up with something like the dietary advice coming out of HSPH. Drawing on data from three long-running studies of lifestyle and health covering nearly 300,000 people, HSPH researchers have shed light on the importance of a healthy diet and what that looks like. HSPH’s Willett, who chairs the Department of Nutrition, said that getting Americans’ diet right can mean the difference between being healthy or ill. Studies have shown that not smoking, eating properly, and keeping a healthy weight — a body mass index of under 25 — reduces the risk of diabetes by 90 percent. “Apart from lung cancer, there is no other disease that can be almost eliminated with simple lifestyle changes,” Willett said. In the years since that first paper linking weight and diabetes, studies by Willett and other Harvard researchers have highlighted the ties between what and how much people put in their bodies and ailments such as diabetes, cancer, and heart disease. Research has shown that increased consumption of soda and fruit juice has closely paralleled the diabetes and obesity epidemics. It has found that even a little bit of moderate-intensity physical activity, such as walking 30 minutes a day, lowers the risk of type 2 diabetes by 30 percent. It has found that coffee lowers diabetes risk, that not all fats are bad, and that not all carbohydrates are good. Recent studies have also linked red meat and diabetes, with processed meats such as hot dogs, sausages, and deli meats the riskiest, according to HSPH Professor Hu. Across Harvard’s campuses and affiliated institutions, scientists are applying cutting-edge techniques to the problem. Chad Cowan, assistant professor of stem cell and regenerative biology and co-leader of the Harvard Stem Cell Institute’s (HSCI) diabetes program, is applying both genetic and stem cell-based approaches to type 2 diabetes. Genetic studies of diabetes are incredibly complex, Cowan said. Initial studies often identify an active area rather than a single gene, requiring more work to discover what specific genes are doing. Researchers then have to figure out whether the genes are active in pancreatic beta cells, muscle cells, liver cells, or fat cells, which all play roles in the disease. Cowan has taken advantage of stem cell technology to grow cells from both healthy and diabetic donors. His lab has created cell lines from different tissues that can be compared, genetically manipulated, and even used for chemical screenings to aid the search for new medicines. People with type 1 diabetes and some who have advanced type 2 diabetes are dependent on daily insulin injections to survive. Future therapy, however, may include replenishing the body’s supply of beta cells. That is the aim of Douglas Melton, Xander University Professor and HSCI co-director. Melton’s lab has made enormous progress in the last five years, inducing stem cells toward beta cells under lab conditions and gaining a better understanding of how to get beta cells to multiply. “We haven’t learned anything to make us believe we won’t be able to make bucket loads of cells one day,” Melton said. At the Joslin Diabetes Center, one research team is on the trail of an elusive substance that seems to “cure” diabetes in those who undergo a particular obesity treatment. Associate Professor of Medicine Allison Goldfine, Joslin’s head of clinical research, is examining two kinds of bariatric surgery and comparing them with lifestyle interventions as diabetes treatments. The study, which is still enrolling subjects, is looking at gastric band surgery, where an adjustable band constricts the stomach, and a gastric bypass surgery called Roux-en-Y. The gastric band surgery has helped patients to lose weight and thus improved their diabetes symptoms. But it was earlier studies on the bypass surgery that caught Goldfine’s eye. Those studies showed that some patients who received bypass surgery, in which the surgeon makes a small pouch in the stomach and bypasses the rest of it, had blood sugars return to normal too quickly to be due to weight loss alone. Goldfine said the possibility that there might be an unknown metabolic compound at work — one that might be the basis of a new drug — convinced her to take a closer look. Absent a new, high-tech solution, weight loss remains an important goal for type 2 diabetics. Studies have shown that losing just 7 percent of one’s body weight can increase insulin sensitivity 57 percent, according to Joslin’s Hamdy. The problem, as dieters over the years have learned, is how to do that. Under Hamdy’s guidance, Joslin’s Why WAIT program has helped 450 people with type 2 diabetes to lose an average of 24 pounds and to keep most of it off three years later. It has improved their disease profile enough that 70 percent were able to reduce their medicine, and 21 percent of those taking insulin were able to stop. Annual total health care savings were calculated at $1,619 per patient, with $996 saved on diabetes-only care. The effort is being replicated at Joslin-affiliated institutions around the world. Why WAIT takes a comprehensive approach, providing nutritional counseling to devise a healthy, low-calorie diet, an exercise program to burn calories, and counseling to help patients modify their behavior. Why WAIT also adjusts medicines to emphasize drugs that either don’t encourage weight gain or that promote weight loss. “You can reverse the cycle if it’s early enough, before there’s significant damage to the pancreas,” Hamdy said. Though answers are emerging from research, government dietary advice has been slow to adjust to the latest findings. That has prompted criticism from some faculty members and resulted in Harvard alternatives to the U.S. Department of Agriculture’s food pyramid and its more recent MyPlate graphics, advising consumers on a healthy diet. One place where the HSPH Nutrition Department’s advice is getting a friendly reception is in Harvard dining halls, where thousands of students eat each day. Though desserts and other not-strictly-healthy foods remain on the menu, Crista Martin, director of marketing and communications for Harvard University Dining Services, said her department follows HSPH’s advice in preparing meals and goes further, trying to spread the word to diners. Diet, of course, is just half the equation. Our ancient ancestors not only ate leaner whole foods, they also were extraordinarily active, Lieberman said. The average hunter-gatherer walked or ran between 9 and 15 kilometers a day. When they were in one place, they worked to prepare food, climbed after fruit, dug for tubers, and the like. “Can you imagine if everyone walked 9 to 15 kilometers a day? Would there be obesity today? Absolutely not,” Lieberman said. Harvard students looking for exercise don’t have to pick their own fruit or dig their own potatoes. They can participate in interscholastic, intramural, and club sports. Likewise, faculty and staff can run, walk, or bike along the Charles River, row on it, take classes on everything from aqua-aerobics to kickboxing, or pump iron at the Malkin Athletic Center or the Hemenway Gymnasium. Dawn Stenis, Harvard Recreation’s area fitness program manager, has even created a program, the Harvard Slim Down, for people not comfortable going to the gym. The program provides nutritional counseling, a personal trainer, and a taste of several activities also offered in longer courses. For those who like to move outside, Harvard President Drew Faust two years ago announced a community program called Harvard On The Move, offering walks and runs through the neighborhood for faculty, staff, students, and members of the broader community. Jeanne Mahon, director of Harvard’s Center for Wellness, said the three-times-a-week walks and runs have drawn a regular crowd, including 50 now sporting free T-shirts after attending six sessions, which meet on the Malkin Athletic Center steps several times during the week and at 10 a.m. on Sundays. Attendance ranges from a handful to as many as 40 for a Sunday run that featured Lieberman — an avid runner whose research fueled today’s barefoot running craze — doing gait analysis. “There’s no medicine that’s more important than exercise,” Lieberman said. Previous studies have suggested that undergoing surgery and general anesthesia may increase the risk of Alzheimer’s, and it is well known that a small but significant number of surgical patients experience a transient form of cognitive dysfunction in the postoperative period.